Please welcome Margaret Weis and Robert Krammes to The Qwillery. The Seventh Sigil, the final book in the Dragon Brigade Trilogy, was published on September 23rd by Tor Books. Margaret: I've written about dragons in almost every world I've ever visited and it's always interesting and challenging to visit a new world where I can meet a new and different type of dragon. Robert: The name of the series is the Dragon Brigade and that embodies our vision of dragon and human interaction: dragons and humans fighting together, not as master and steed, but as partners. Margaret: Thus we developed the Dragon Duchies, a state within the kingdom of Rosia inhabited by noble and common dragons. The dragons have their own laws, but are loyal to the king of Rosia and share a common interest in the welfare of the kingdom, for they are members of the royal court with titles and rank granted by the king. Robert: Dragons manage vast estates, worry about their vassals, run large business enterprises and pay taxes. Dragons have also become patrons of the arts, for they are extremely fond of music and painting and sculpture. Deeply regretting their own inability to create fine works of art, noble dragons invite musicians and artists to live with them in their vast and luxurious palaces. Most important, the dragons serve in the Dragon Brigade, fighting alongside humans to defend Rosia against her enemies. A dragon's fiery breath can not only sink a ship, the dragon can destroy the magical constructs used in this world for everything from strengthening the walls of a fortress to firing off cannons. Margaret: Dragons undergo the same basic training as their human riders, for dragons have to learn their own set of combat skills. For example, a dragon attacking an enemy warship has to take care not to get her wings tangled in the rigging, while a dragon who is fond of doing barrel rolls in midair might not want to perform that maneuver with a human rider on his back. Robert: Common dragons also serve in the Brigade, but they are not permitted to have a human partner. They are sergeants in the brigade, assigned such "ground-based" duties as keeping the noble dragons supplied with food and doing the heavy lifting and hauling. Margaret: Sadly, as our story begins, such peaceful interaction has ended. Dragons and humans are no longer on speaking terms. The king of Rosia insulted the noble dragons by disbanding the Dragon Brigade, saying dragons were no longer needed due to the development of immense, magically powered naval vessels. The angry dragons have withdrawn from the Rosian royal court, causing the human inhabitants of the Dragon Duchies to flee, fearing the dragons might attack them. Robert: The long-time bond between humans and dragons--a bond that once kept a seventy-foot dragon lieutenant standing stiffly at attention while his six-foot human captain issued a stern reprimand--has been broken. Former human members of the Dragon Brigade, such as our hero, Lord Captain Stephano de Guichen, deeply deplore the rift, while Rosia's enemies plan to take full advantage of it. Margaret: All this just at a time when the dragons will be most needed, for a strange, new, demonic foe is about to threaten Rosia and the magic that is all pervasive in our world. Robert: What's fun to me about this world is picturing two grizzled old veterans of the Dragon Brigade, one human and one dragon, sitting around the campfire recalling their glorious deeds during the Blackfire campaign. That is the type of bond between humans and dragons we set out to portray. Margaret Weis and co-author Robert Krammes bring the enthralling Dragon Brigade trilogy to a thrilling conclusion in The Seven Sigil, a sweeping novel of worldwide war and personal redemption. Five hundred years ago, a clan of rebels was banished to the bottom of the enchanted world of Aeronne; ever since, these Bottom Dwellers have sought revenge, and now they are waging all-out war on the rest of humanity. Their deadly “contramagic” beams destroy buildings and attack naval airships, and their demonic drumming brings terrible storms and disrupts the magic of the people and dragons Above. The attack of their full contramagic power will create a magical armageddon. In an effort to prevent further death, Captain Stephano de Guichen leads the Dragon Brigade, taking the fight to the Bottom. But strength of arms alone will not be enough to conquer their foe. As the Bottom Dwellers’ blood magic eats away at the world, those Above realize their only possible defense lies in the heretical secrets of contramagic. Loyal priests must decide whether to protect the Church, or risk its destruction in pursuit of the truth. Only the Dragon Brigade can prevent an endless dark age. Their epic battle will test the mettle of those thrown into the breach, and determine the fate of this magical world. 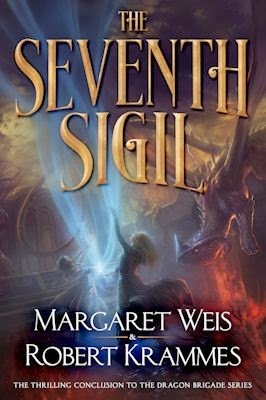 MARGARET WEIS is the internationally bestselling author and coauthor of The Dragonlance® Chronicles and other great fantasy series. She also is the roleplaying games publisher of such franchises as Smallville and Firefly. She lives in Wisconsin. ROBERT KRAMMES lives in Southwest Ohio. He is a longtime member of the Society for Creative Anachronism. Who and When: The contest is open to all humans on the planet earth with a US or Canadian mailing address. Contest ends at 11:59 PM US Eastern Time on October 6, 2014. Void where prohibited by law. No purchase necessary. You must be 18 years old or older to enter. Eragon and the Harper Hall Trilogy :) Thanks for the fun spotlight! My favorite is Pern Chronicles followed by The Enchanted Forest Chronicles. Dealing with Dragons/the entire Enchanted Forest series! Lord of the Rings, and Smaug - the grandaddy of them all. The Dragon Riders of Pern..I've .loved them since I was a kid.